Ever more damaged and downcast, the core characters of Sundance TV’s most acclaimed series return this week to perhaps take their final bows and blows. 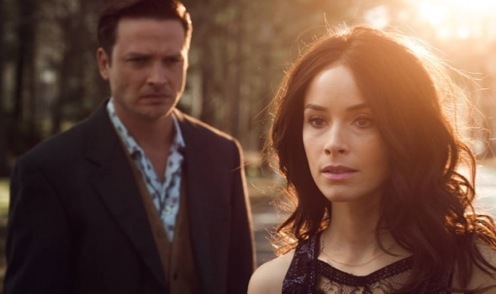 Rectify starts its Season 3 on Thursday, July 9th at 9 p.m. (central). But it’s composed of just six episodes, down from last season’s 10 and back to the level of Season 1. That sounds like a wind-down if not a read-between-the-lines eviction notice. But is that sadder than some of the principals have become? Debateable. Season 2 ended with Daniel Holden (Aden Young) accepting a plea bargain in which he admitted to strangling his 16-year-old girlfriend, Hanna, back when both were teenagers. In return he is guaranteed his freedom without fear of serving any more time. In Season One, Daniel’s 19-year stint on death row ended with the uncovering of contrary DNA evidence that indicated he was not alone on that fateful night. Amantha Holden (Abigail Spencer) remains infuriated by her brother’s admission of guilt. She had stood by him all along, but now wants Daniel out of her life. Well, not entirely, but how else is she to regroup and move on? Not that a potential manager’s job at Thrifty Town has Amantha bristling with excitement. Another downer: her intimate relationship with Daniel’s latter day attorney, Jon Stern (Luke Kirby), also has broken up. Mama Janet Talbot (J. Smith-Cameron), who remarried after Daniel’s father died, is likewise blue, although with some resilient strength. But her husband, Ted Talbot Sr. (Bruce McKinnon), wants Daniel gone after learning that he assaulted high-strung son Teddy Jr. (Clayne Crawford), whose wife, Tawney (Adelaide Clemens), has recently left him after suffering a miscarriage. And if that’s not enough angst . . . well, frankly it is, thank you very much. The first two episodes made available for review do nothing to clear these forests. Young’s Daniel remains the monotonic center point, trying so hard not to be a burden to anyone while also having no idea where he’ll go and what he’ll do next. In a welcome smidgen of levity, he makes his idea of a gourmet “nostalgic meal” for Amantha, including smothered franks, tater tots and the offer of an “aperitif.” But Daniel’s intentionally over-heated presentation gets a cold shoulder from his sister near the close of Season 3’s Episode 2. Teddy Jr. also gets ample screen time in these early episodes. And while still not a sympathetic character, his pains, woes and awkward attempts to make amends put him in a slightly better light. Tawney weeps a lot and sees a therapist while Mama Janet absorbs one rebuff after another. Her home and daughter Amantha’s are grimly dark in daytime and not all that much brighter when the lights come on at night. One could throw a shroud over the entire proceedings, but it would only be redundant. Still, Rectify can be both hypnotic and heart-wrenching for viewers who have invested in these characters throughout the first two seasons. Season 1 remains the high point, though, and there doesn’t seem to be much time left to scale some of those peaks again. One can ache for Daniel and all he’s been through while at the same looking forward to the day when both he and we will be put out of our miseries. Just don’t expect any bright, sunny days during what appears to be the homestretch of a series that remains unique and involving and oh so damned sad. Note to readers: On the day after this review was posted, Sundance TV announced that it has renewed Rectify for a fourth season. “With an exact episode count to be determined,” the network says.